Screaming for a Different Kind of Ice Cream! As the old summer time saying goes, “you scream, I scream, we all scream for ice cream!”. However, these days more and more people scream for a different ice cream, and this has most often meant dairy free “ice cream”. While some people are looking for a lower-saturated-fat, heart-healthy option, others are looking for lactose-free options with the growing recognition that most people are lactose intolerant. For others, a more animal-friendly and environmentally-sustainable option is their dessert of choice. For these reasons and many more, frozen dessert manufacturers now offer a great variety of non-dairy “ice cream” products to enjoy. Soy, almond, rice and coconut form the base for most of the products out there, although new ones such as hemp ice cream are starting to emerge. You’ll find several brands available in many grocery stores and supermarkets. Some popular ones include So Delicious, Almond and Rice Dream, Luna and Larry’s Coconut Bliss, Amy’s, Tofutti and Washington’s very own, Full Tilt. The wonderful array of varieties on non dairy frozen desserts also come with many sweetening options. You’ll find a selection of unsweetened flavors for those who like it plain. For those with a sweeter tooth, sugar-sweetened in varying amounts and even stevia-sweetened versions are available. You’ll find just about every flavor and style you can think of – even a gelato! Adding to this embarrassment of riches are the many different forms to be enjoyed. Besides the traditional pint and quart containers, there are sandwiches and bars for grab-and-go snacks. 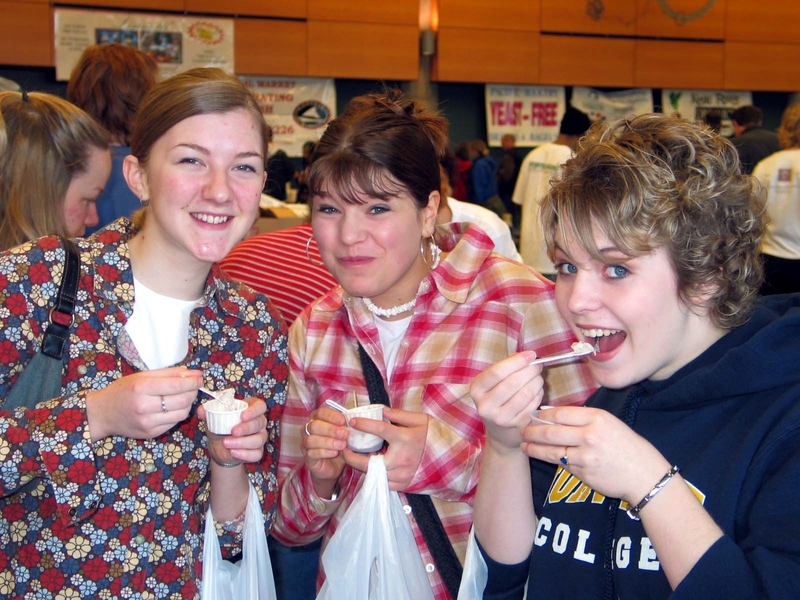 Many of the dairy-free brands and varieties were featured at Vegfest and were quite the hit! Look for this segment of the food world to continue its growth. In fact, so many people are going dairy-free these days rumor has it that even Ben and Jerry’s will come out with a non-dairy ice cream early next year. As the weather heats up we’re all glad to have these choices for occasional summer treats.